AMHERST—For those looking for entertainment on Tuesday night, the University of Massachusetts Fine Arts Center did not disappoint. 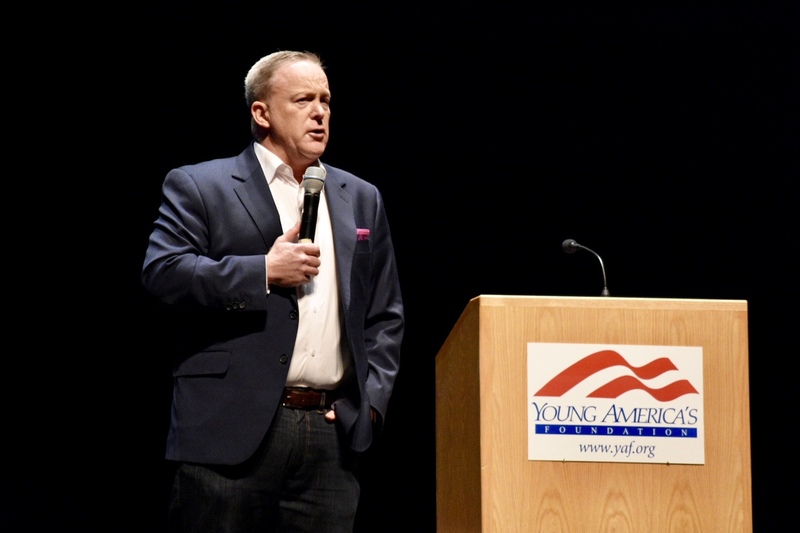 Sean Spicer, former press secretary for the Trump administration, discussed his career path and experience in the White House before a crowd of about 1,300 people. On tour to promote his book, “The Briefing: Politics, The Press, and The President,” Spicer spoke for about an hour before answering questions audience members had written on note cards. A small section of the crowd erupted in protest at this point of the event, singing and chanting in opposition to Spicer and the administration he once represented. Spicer and his parents worked hard to make ends meet. Education was important to him from a young age, Spicer said, and he recalled convincing his parents to let him apply to Portsmouth Abbey School, a competitive Roman-Catholic boarding school in Rhode Island. With the help of financial aid packages, Spicer’s family scraped by and paid the tuition. His “awakening” to the world of government and politics came during his undergraduate studies at Connecticut College. Spicer’s government classes in school prompted him to consider different interpretations of the role of government, and he discovered his views leaned toward the right end of the political spectrum. With his enthusiasm for politics fully ignited, Spicer started volunteering in local campaigns, gaining valuable experience with each election. In 2011, he became the communications director for the Republican National Committee, leading what he called the “new model” of electoral politics that led the GOP to crucial victories in 2014 and 2016. He led an intensive grassroots movement, collecting data for over 190 million voters across the country through field teams — knocking on doors, making phone calls and engaging in local culture. This provided the Donald Trump campaign with data that increased their confidence, despite the mainstream reports and polling data. Spicer’s loyalty to Trump and Republican politics earned him the position of White House Press Secretary following Trump’s victory. Having had “only 600 or so” on-camera opportunities beforehand, Spicer said he discussed the coming adjustment to fame with his family. “My life changed in words I could never describe,” he said. The crowd erupted with laughter. Everything seemed to be going as planned for the former press secretary. As Spicer transitioned to discuss his position at the White House, however, the crowd became rowdier. “Did you lie?” One audience member asked. Spicer, appearing unbothered by the protest, pretended to orchestrate the song with his microphone. Members of the group continued to stand up, unafraid to voice their opinions of the former press secretary and the Trump administration. “Do you want to engage in a civil and respectful discussion, or just yell at me?” a clearly frustrated Spicer asked. This hushed the crowd for a short period of time as the event moved into the Q&A segment. The crowd erupted when Nick Consolini, UMass College Republicans president, announced that Spicer would answer preselected questions. “Take questions from the crowd!” one audience member shouted. Chants of “free speech” and a wave of booing rang throughout the Fine Arts Center. At around 8 p.m., after Spicer had successfully answered three questions from Consolini, the event came to a close. Consolini later clarified in a statement that the College Republicans had no discretion over the Q&A format despite the frustrations in the crowd. The College Republicans are no stranger to controversy and protest at their events. In April 2016, the RSO invited Steven Crowder, Milo Yiannopoulos, and Christina Hoff Sommers to campus to host a panel titled “The Triggering.” Similar protesters arrived in full force to the event, attempting to interrupt the discussion. The UMass Graduate Employee Organization staged a protest outside the Student Union prior to Spicer’s talk. Toward the end of the event, Spicer invited the group of protesters to the stage. Consolini applauded the action, but was unpleased with the end result. Email Matthew at [email protected] or follow him on Twitter @matt12dipesa.